Today, 30 November 2018, marks the official launch of the Sanremo site of the High V.LO-City project by the Mayor of Sanremo, Alberto Biancheri. Three fuel cell electric buses and their hydrogen refuelling infrastructure have been deployed in the city. 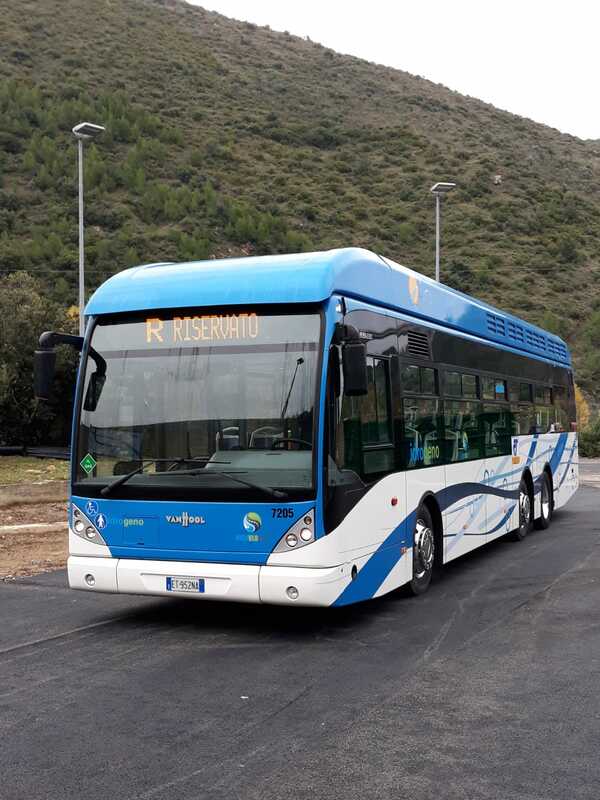 The deployment and testing of the buses is part of the High V.LO-City project, which aims at facilitating the deployment of fuel cell electric buses and their related hydrogen refuelling infrastructure in European cities. The project is co-funded by the Fuel Cells and Hydrogen Joint Undertaking. The three Van Hool buses are operated by the local bus operator Riviera Transporti and are replacing conventional diesel fuel buses, in an effort to cut emissions from public transport in the city. The three buses will enter in full operation at the beginning of December. Bus drivers have been trained to operate the buses as well as to refuel them. They have also been trained by Ballard, the fuel cell provider. The buses will be operated on the Sanremo – Taggia suburban line, which is about 14km long.